The namechange became official during 2003, after having traded (dba - doing business as) as ATA for some time and the name American Trans Air can be written in history books. Boeing 727-264(Advanced) N765AT (c/n 23014/1816) on final approach into Chicago O'Hare's Int'l Airport on 02Aug98. 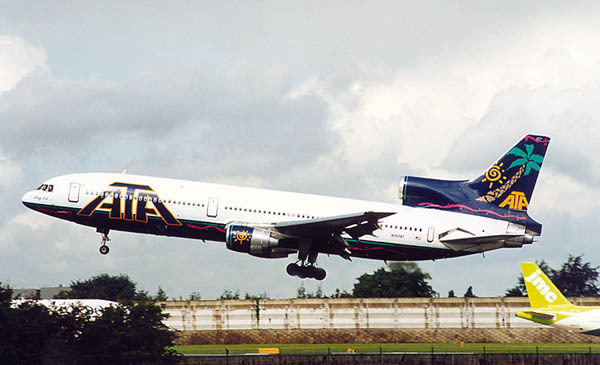 This colourscheme was familiar for a long time, but around 1998 also the more festive colourscheme below was introduced. 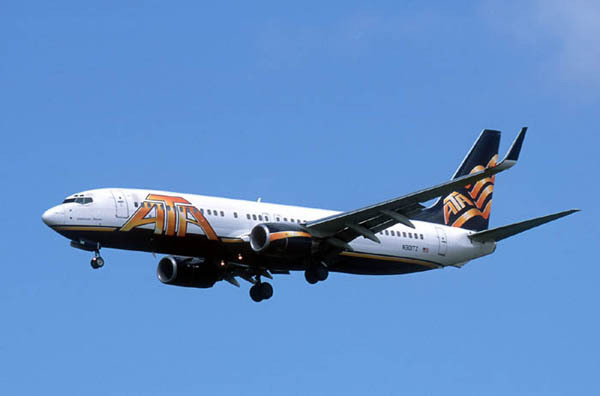 ATA (ATA Airlines, Inc), providing scheduled service to 40+ destinations. ATA Training Corporation, provides training for students to become certified Air Frame and Power Plant Technicians. Lockheed L.1011 tristar 50 N197AT (c/n 193P-1082) at Manchester,UK on 19Aug2000. 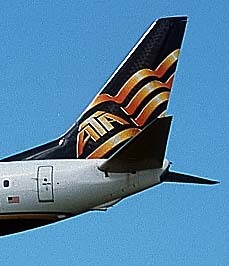 Close up of the newly revised taillogo. 2001 Begins re-fleeting process and scheduled service from Chicago-Midway to international destinations. 2002 ATA becomes the number one carrier from both Indianapolis International Airport and Chicago-Midway, and the third largest carrier overall in Chicago, based on the number of passengers flown. 2003 ATA announces a company name change from American Trans Air, Inc. to ATA Airlines, Inc.
ATA Airlines failed in 2004.